Warm Pasta Salad with Baked Goat Cheese, Thyme for Cooking summer salad. This is a cross between a hot, winter pasta dish and a cool, summer salad. Breading the cheese keeps it firm. The goat cheese normally comes log-shaped (long, round), and wrapped in paper. It will have a thin rind that is an edible part of the cheese. You could substitute another, semi-soft cheese such as Brie or Camembert. Drain and toss with 1 tbs olive oil. Peel and roughly chop shallot. Cut Prosciutto into bite-size pieces. Heat 2 tbs olive oil in medium nonstick skillet. Add shallots and sauté until starting to brown, about 15 minutes. Add Prosciutto, and sauté 2 - 3 minutes longer. Add cherry tomatoes and heat through. Add vinegar and pasta, and stir/toss to combine. Slice cheese into 4 to 6 rounds. Each round should be between 1/3 and 1/2 inch thick (about 1cm). 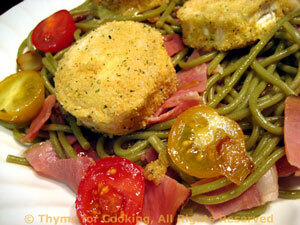 Put bread crumbs on one plate and 1 tbs olive oil on another plate. Roll the edges of the cheese in the oil, then dip both sides, so it's completely coated. Repeat procedure in the crumbs - so each slice is coated. Place on a baking sheet. Bake, 400F (200C) for 3 - 4 minutes, just until you see the tops sink slightly or cheese ooze slightly. If it hasn't happened after 4 minutes, take them out anyway - they're ready. To serve: Divide pasta between 2 plates. Top with rounds of cheese and serve immediately.